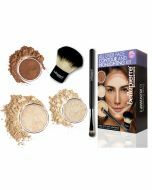 The Bellapierre Cosmetics Contouring and Highlighting Kit provides you with all of the essentials to enhance and sculpt your complexion like a professional. 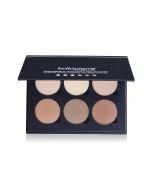 Made with 100% natural minerals, this collection includes two contour and two highlight shades. Also included is the cruelty-free Kabuki Brush, for blending and smoothing harsh lines. Achieving perfect dimensionality has never been easier with our 5-step process. Step 1: Begin with the Contour Powder “One”. Using a light hand, apply this powder with a medium fluffy brush around all edges of your face; including the forehead, cheekbones, nose, and chin. This will bring overall warmth and dimension to your face. Step 2: With a smaller brush, apply the darker Contour Powder “Two” anywhere you want to slim or define your features. Typically, this powder is applied on the outer edges of the forehead, on either side of the bridge of the nose, underneath cheekbones, and along the jawline. Don’t worry about blending yet, that’ll be Step 5! Step 3: Using a small brush, gently sweep the Highlight Powder “Three” from your lower lash line to the top of your cheek bone, filling in the area of skin in the middle (this should be quite a large surface area). Then, apply the powder down the bridge of your nose, chin, and center of your forehead. 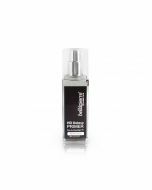 This will bring out your key features which usually appear dark and puffy, to make them look brighter, healthier, and fuller. Step 4: Using a small brush, apply the lighter Highlight Powder “Four” to the skin just above the Cupid’s bow, to the inner corners of the eyelids, on the brow bone underneath the eyebrows, and to the tip of the nose. This powder should be used on any areas you want to emphasize. Step 5: Using the Kabuki Brush provided, gently blend the contour and highlight shades on your face to create the subtle illusion of depth and dimension. This step is very important; there should be no harsh lines. Be sure to blend the contour powder on your chin down to your neck so that they match.